Dear reader, if you’re wondering what this book is going to be about, let me give you a small glimpse of it from my perspective, and tell you how it came to be. This book essentially explores various facets of luxury brands, which used to be a niche market, but only till some time back. As the realms of luxury and affordability fuse with common people, this book takes a strategic, behavioural, historical, experiential, demographical, psychological, dynamic, mechanical, and also a philosophical look at what constitutes luxe or dazzle. It is a bible for all stakeholders of luxury brands – owner, custodian, retailer, connoisseur as well as student – helping them understand and formulate, with a historical perspective, an effective strategy for conceiving, positioning, placing, promoting and pricing these luxury products. With the ebbing Chinese luxury story, most luxury goods providers – including world’s biggest luxury group LVMH (Moët Hennessy Louis Vuitton SE) – are shifting focus to the growing luxury consumer base in India, which is poised to grow at 25% from 2013 till 2018, and is likely to touch $18-billion mark from the ongoing level of $14 billion. The book narrates the story of the Great Indian Middle Class, their aspirations, and how, contrary to popular perception, they are the biggest drivers of luxury brands in India. Decoding Luxe traces the journey towards democratisation of luxury from royal exclusivity. Today, with the New Maharajas, even royalty is just a swipe away. And then there’s the dark side of luxe and the great escape. Luxury consumers, although classified into Experientialists, Connoisseurs, Flaunters and Aesthetes, show mixed and overlapping characteristics. The only thing that is all-pervasive is perhaps “pricesensitivity”. You will also get to know of an entire industry working on luxury counterfeits available online and how e-commerce has failed to repeat its success story with luxury brands. I have also tried to give herein the life cycle of a luxury brand, its Seven Ages, as well as its Ego. You will come to know how over a period of time a brand or product comes to acquire a life of its own, influencing and affecting the producers, sellers and consumers alike. However, this book is not at all about product reviews, which is what is largely considered as luxury writing in India and abroad. This book will not tell you what to buy and from where to buy it. No! This isn’t a catalogue of luxury goods and boutiques. Decoding Luxe takes you on a quest through dreams, aspirations, contradictions, myths, royalty, and realities that shroud this very mysterious element called luxury. My best wishes for the book. The romance of luxury has waited long for such a deft rendition of insight and eloquence. This is a delightfully written book, not on brands and consumers, but on luxury brands and luxury consumers. It is rich in anecdotes and you will discover facets of luxury consumption (the sub-title of the book) that you didn't know about. A wonderful read. 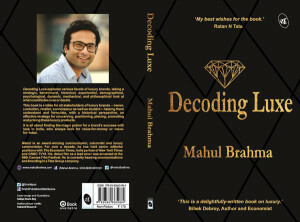 For me, Mahul Brahma’s book “Decoding Luxe” works as a much needed cultural history of dazzle. The book is an essential step to understanding the tug and pull of a class-based society, a brilliant attempt at understanding its various mysteries. The book could become one of the most important devices to understand the codes and the unseen forces that drive our society. A quiet voice that will have a thundering impact. An essential read. Mahul has crafted a lovely story around luxury in India from the Maharajas to the newer rich. This is a great read for anyone interested in the science of vanity and what makes luxury tick. All luxury brand wants to be aspirational without alienating people or being aloof. This book has many illustrative examples to satiate your curiosity. Mahul’s book is a seminal and in depth work that feels the pulse, not just of the luxury industry but also that of the consumer. He does a huge favour to both – makes life easier for the brands by telling them how to tap into the Indian psyche further on one hand and whets the appetite of buyers excited by luxury on the other. Mahul’s style is lucid, his analysis impeccable. This book is a must have. My friend Mahul's attempt to understand the dynamics of this market seems timely. I was pleasantly surprised to find that Mahul has worked hard to decode even the customer. In a market that is ready to explode, understanding the customer could well be the key to retaining her, and to expanding the scope of the luxury segment itself. In Decoding Luxe Mahul has been able to bring in new thoughts, ideas and perspectives. I like the innovative measures he has created -- Luxe Quotient and Luxe Factor. These measures are a good way of capturing something as intangible as desire or dazzle. This will be a great measure for luxury brands to understand the desirability of their brand. I also liked the way he has dealt with the issue of luxury counterfeits that are available so easily online. Mahul has a great love for luxury watches and had almost twisted my wrist a couple of times to check out my watch. He has a very lucid style of writing. Decoding Luxe is a fantastic read and it gives a fresh perspective to luxe. He has been able to address some of the core issues that any luxury retailer needs to know to do business in this country. I believe this will be a good manual for luxury retailers and will be able to create tangible value for them. Mahul is a gifted writer. He is very passionate about luxury. I loved the way he has been able draw a parallel between the life cycle of a luxury brand and Shakespeare’s description of the Seven Ages of Man. The book gives a very unique perspective to luxury. Decoding Luxe is a great read and I am certain it will be a success. Mahul has been a prolific writer since his journalism days. I liked the way he has been able to introduce some unconventional ideas and thoughts such as e-commerce will not succeed as far as luxury retailing is concerned despite it being a successful retailing model in the country. I am certain Decoding Luxe will be greatly appreciated. I am an avid reader of brand books and I think Mahul’s style has been very refreshing and easily digestible. I have been reading his columns on luxury for quite some time now in ET. I like the way he thinks about luxury and its various facets. He has managed to give a personality to luxury in the book – a luxury brand has an ego, personality and life cycle or rather Seven Ages. Decoding Luxe is a fantastic read and it will be a great success. I love the way Mahul deconstructs the mystical world of luxury with his simple, direct, matter-of-fact lucid style of narration. Mahul has chosen an area where there is very limited literature globally and has taken a holistic view of luxe. Something that was much-needed. Decoding Luxe is a very well written book and I am sure it will be a great success. Decoding Luxe is a one-of-its-kind holistic book on this subject of luxury. Mahul has presented his thoughts and perspectives in a conversational style. It is a great handbook for luxury brands who want to understand the Indian market and its consumers well. It captures many unconventional and rather counter-intuitive perspectives like how luxury has been driven by the Middle Class, thoughts that were not earlier penned by luxury writers. Luxury is a space that is much uninhabited as far as literature is concerned. Similarly, India is a market that has not seen much being written about as a luxury destination, in spite of our rich history with luxury. I applaud Mahul for his brilliant attempt at decoding luxury and presenting a holistic view on this subject with a focus on India. Decoding Luxe is a must read.